A group of heavily armed ski-masked gunmen set fire to over 20-million pesos worth of road-building equipment of a firm that was involved in a road project in Lake Sebu, South Cotabato. Witnesses said the gunmen arrived in the area just after 8pm on Monday at a makeshift equipment depot of the Gemma Construction Company in the western region of Lake Sebu. 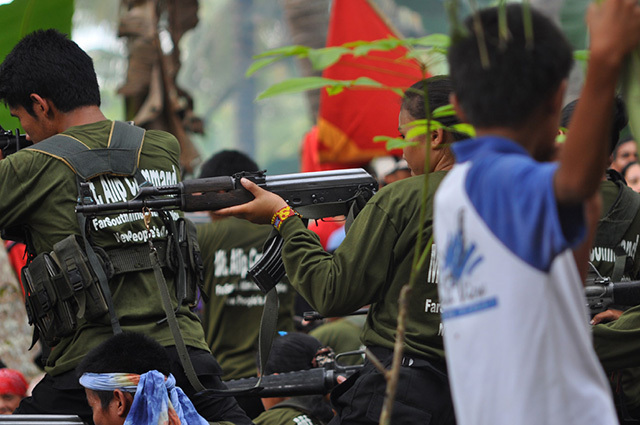 The suspected NPA guerrillas corralled the workers into one area and set fire to a bulldozer and two excavators with the use of kerosene and dry coconut palms. The mayor of Lake Sebu told reports the construction company is building a road designed to interconnect peasant enclaves in Barangay Lamfungon. Barangay Lamfungan is adjacent to mountain ranges where the New People’s Army guerrillas are holding out. NPA rebels in Mindanao are known to torch or sabotage government projects, often burning expensive equipment if “protection money” is not paid on their demand. Just last week, NPA rebels burned 25-million pesos worth of construction equipment on the outskirts of Davao City in a similar attempt to control a new road project.